LONDON -- A fast-moving overnight fire engulfed a 24-story apartment tower in London on Wednesday, killing at least 12 people and injuring dozens of others, police said. Desperately trying to avoid the flames, residents threw babies and small children from high windows to people down on the sidewalk, witnesses said. The inferno lit up the night sky and spewed black smoke from the windows of the Grenfell Tower in the North Kensington neighborhood, where more than 200 firefighters battled the blaze. Authorities say the fire injured 74 people, 18 of them critically, and left an unknown number missing. U.K. news outlets reported as many as 600 people were believed to live in the building. The smoke stretched for miles across the sky after dawn, revealing the blackened, flame-licked wreckage of the building, which was still burning over 12 hours later. London's Metropolitan Police gave the preliminary death toll of 12, but said that, given the magnitude of the disaster, that figure was likely to rise. "In my 29 years of firefighting I have seen nothing of this scale," London Fire Brigade Commissioner Dany Cotton said at an early morning briefing to journalists. Flames shot from windows all the way up the side of the 24-story Grenfell Tower in North Kensington as firefighters battled the blaze. 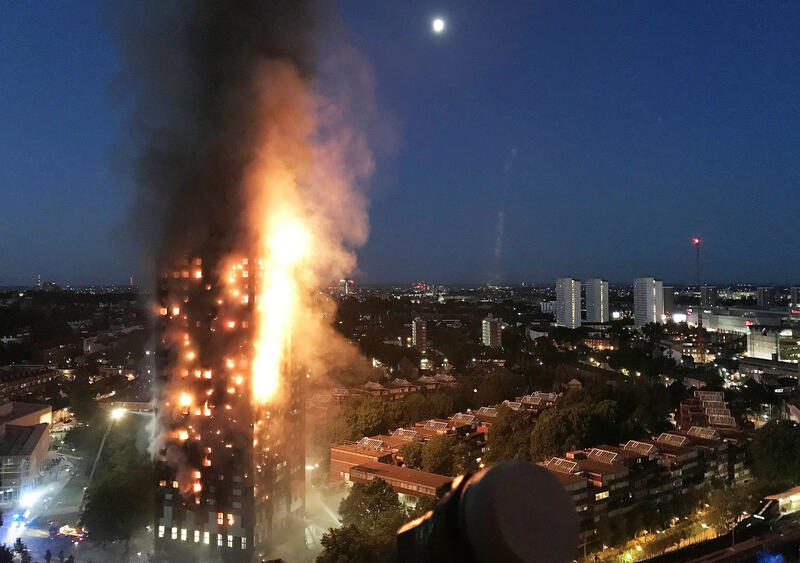 Paul Littlejohn, who lives opposite Grenfell Tower, told the BBC he woke up at about 1:30 a.m. (8:30 p.m. Eastern on Tuesday night) to see the building across the street "in a towering inferno, blaze, just fire coming out of every window, windows smashing and exploding." "Things falling out, people screaming, people jumping out on fire, chucking ropes down what they'd made out of bed sheets, to try and climb out. Just complete nightmare, absolute nightmare," recounted Littlejohn. Two separate witnesses told CBS News they saw parents throwing young children or babies from balconies in an effort to save them from the flames. At least one infant was caught by a person on the ground and survived, according to a witness who spoke to the Huffington Post. The fate of the child's mother, who threw the baby off a balcony wrapped in a sheet or blanket, was not known. By mid-morning in London, fire crews trying to clear the building had reached the 19th floor of the tower, searching room-by-room for victims or survivors. Structural engineers were monitoring the building closely, but were not immediately concerned of a potential collapse. Residents recalled waking up to the smell of smoke and sound of screaming, and then rushing to escape through smoke-filled corridors. "Around midnight my brother initially woke me up, and screamed, 'there's a fire!' So we went out and initially it was only on the third, fourth floor, so it wasn't too bad," Samira Awil, who lives in the charred building, told CBS News on Wednesday morning. "Within half an hour, an hour, it literally went to the top floor and there is about 23 floors up there, so it was really bad. It caught on really quickly and it was, there was obviously people on the balcony screaming for help." The blaze started around 1 a.m. London time, but 11 hours later smoke was still pouring from the building and flames could still be seen in some of the upper floor windows, out of the reach of fire hoses on the ground. Only one person was seen being pulled out of the building alive. Ahlam Said, who made it out of the blaze early on, was emotional as she spoke to CBS News outside the building. She said her friend, with her five children, were all unaccounted for. People who live nearby were evacuated, some carrying pets in their arms as they left. Volunteers handed out bottled water and collected donations of food, clothing and household items for families who lost their homes. Police closed the A40, a major road leading out of West London, while some parts of London's Underground train network were closed as a precaution, Reuters reported. The London Fire Brigade said 45 fire engines and 200 firefighters were called to the scene. "The prime minister is deeply saddened by the tragic loss of life in the Grenfell Tower and is being kept constantly updated on the situation," a spokesman for Prime Minister Theresa May said in a statement.